May 24, 2015 is International Women’s Day for Peace and Disarmament. 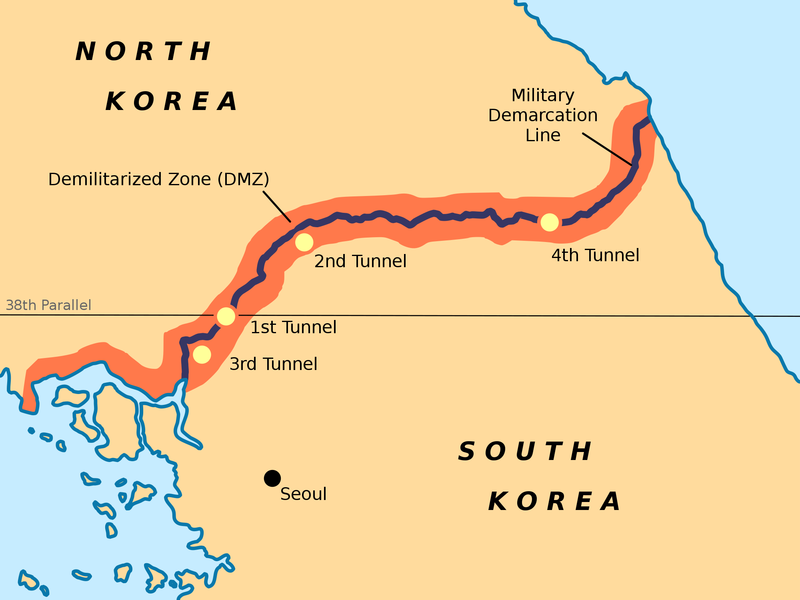 On this day, Korean women will walk for peace across the Demilitarized Zone (DMZ), the 4 km wide buffer that divides North and South Korea. They will be joined by international peace activists, including Gloria Steinem; Nobel peace laureates Mairead Maguire from Ireland and Leymah Gbowee from Liberia; human rights lawyer Patricia Guerrero from Colombia; former U.S. Army Colonel Ann Wright; and Code Pink co-founder Medea Benjamin. The goals of the group, Women Cross DMZ, are simple: to end the Korean War with a peace treaty, to reunite divided families, and to make sure that women are involved in all levels of the peace-building process. Ambitious as that may sound, the project’s organizers rightly feel that conventional approaches to peacemaking on the Korean Peninsula have failed. This diverse collective of women is working to resolve the continuing tensions of this “forgotten war” by putting the question of peace back on the table. And they need the support of the public to send a clear message that the status quo is untenable and that ordinary people, not just state actors, can make a difference in the movement for peace on the Korean Peninsula. In truth, there is a long history of peace activism working to end the unending Korean War, the longest military conflict in U.S. history, and Women Cross DMZ falls squarely within this tradition. In the early 1950s, opposition to the Korean War was articulated through an embattled peace movement and organizations such as the Peace Information Center (PIC), a founding member of which was an 82 year-old sociologist, historian, and civil rights activist, W.E.B. Du Bois. There is still this tendency to vilify anyone who invokes peace in the context of the Korean Peninsula, and the organizers of the peace walk have been called naïve, stupid, dangerous, strange, and duplicitous. When Christine Ahn, one of the organizers of Women Cross DMZ and a policy analyst with expertise in Korea, globalization, militarism, women’s rights and philanthropy, went on CNN’s Situation Room, journalist Brian Todd, in a sad display of tabloid sensationalism, redbaited Ahn, suggesting that the peace walkers were “in league” with Kim Jong-un. Yet as John Feffer discusses, when Hyundai founder Chung Ju-yung drove 500 head of cattle across the DMZ in 1998, and again in 1999, in similar gestures of peace and goodwill, he was universally praised. The hysterical response to the peace walk appears to be an ugly combination of McCarthyism and misogyny. And because Women Cross DMZ threatens the status quo, the movement has elicited both passionate, wide-spread support and an equally intense backlash. The literary critic, public intellectual, and activist Paik Nak-chung argues that civil society is a critical site where the project of overcoming division and ending the war ought to be instigated. In The Division System in Crisis, Paik writes, “There needs to be a great number of ordinary citizens–in addition to reunification activists–who can participate in the unique process of Korean–style reunification”. For Paik, a professor emeritus at Seoul National University, ordinary citizens need to come together to build a “people-oriented,” “third party” discourse in which the people of North and South Korea are not viewed as separate entities, but as inhabitants of the whole Peninsula. The project of working for peace and overcoming division needs to emerge from the bottom up, from the grassroots level; the issues of peace and reunification are too important to be left to foreign policy “experts” or professional politicians. This is a movement without guarantees. Nevertheless, Women Cross DMZ, which builds on some 60 years of peace actions for Korea, is a profound step into a vision of the future in which the zone separating North and South Korea truly is demilitarized. If you are interested in joining this movement, the 300 participants in Women Cross DMZ plan to arrive at Panmunjeom in the morning on the 24th, and will walk along the DMZ near Imjingak. They will proceed to the Unification Bridge where they will be joined by the public at 2 p.m. Together, people and participants will then walk to Imjingak (approx. 1.9 km) for an opening ceremony and cultural festival. This ceremony begins around 3 p.m. and is also open to the public. From there, the participants will depart for the nearby city of Goyang, which will be declared a “Peace Unification City.” The exact schedule is subject to change depending on unexpected circumstances. On Monday, May 25th, there will be an International Women’s Peace Symposium at Seoul City Hall. Final announcements regarding the schedule of Women Cross DMZ will be made two days before the event. For more information please go to www.WomenCrossDMZ.org. You can also find updates on Facebook and Twitter. John R. Eperjesi is an Associate Professor of English Literature at Kyung Hee University in Seoul. He received his Ph.D in the Literary and Cultural Theory program at Carnegie Mellon University, and is the author of The Imperialist Imaginary: Visions of Asia and the Pacific in American Culture (University Press of New England, 2005). He has published articles and book reviews in Amerasia, Asian Studies Review, boundary 2, The Contemporary Pacific, Inter-Asia Cultural Studies, Korea Journal, Minnesota Review, Pacific Historical Review, and is currently working on a new book on representations of the Korean War in U.S. culture.